Nail Patella's syndrome causes abnormalities in the nails, knees and pelvis. 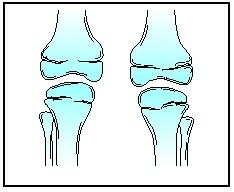 Nail Patella's syndrome occurs in 1 of 50000 people. Nail Patella's syndrome is transmitted from mutations in the LMX1B gene. Physical therapy and bracing can help joint pain. Life expectancy is only affected if they develop kidney disease. Other areas of the body can be affected such as the kidney and eyes. The effects may be minor or as major as needing a wheelchair. The syndrome can be inherited or can occur even without any history of the syndrome.